On this section of the site you can read various translations concerning Shining Force III. Hosted here is the scenario 3 translation and various other pieces of translations such as pages of information from the Softbank Official Artbook. This is a translation of scenario 3 of Shining Force III. The translation isn't 100% complete and different sections have been translated by different people. Permission to use these translations has been given, and each translator is credited at the top of each section. The translations have been ordered into printer friendly pages so you can print them off and read them while playing the game, if you wish. 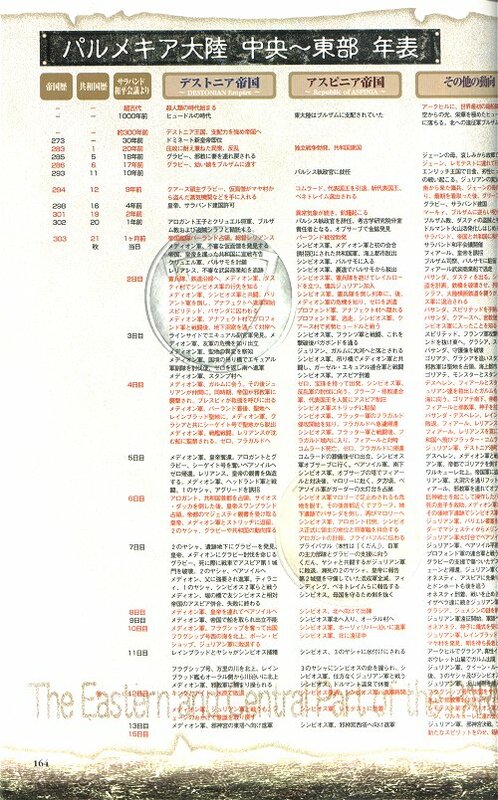 This is a translation of the chronicle on page 164 of the artbook, it places a chronology of events that happened prior to the beginning of the game. On this page is the list of names in the Premium Disc's 3D gallery translated to English. On this page are translations of the speech from the characters in Synbios' force (as spoken in the battle scenes) as well as listing of each character's seiyuu (voice actor). On this page are translations of the speech from the characters in Medion's force (as spoken in the battle scenes) as well as listing of each character's seiyuu (voice actor). On this page are translations of the speech from the characters in Julian's force (as spoken in the battle scenes) as well as listing of each character's seiyuu (voice actor).